Print the template out and have the child cut the picture out. You can laminate this if you want. You could also print this on card-stock if you want it to hold up a little better. Attach the picture to the popsicle stick using the tape or glue. Stick down in a potted plant. What a fun idea for the kids to do for the parents that have potted plants. This is a picture of a little pumpkin carrying his Bible. 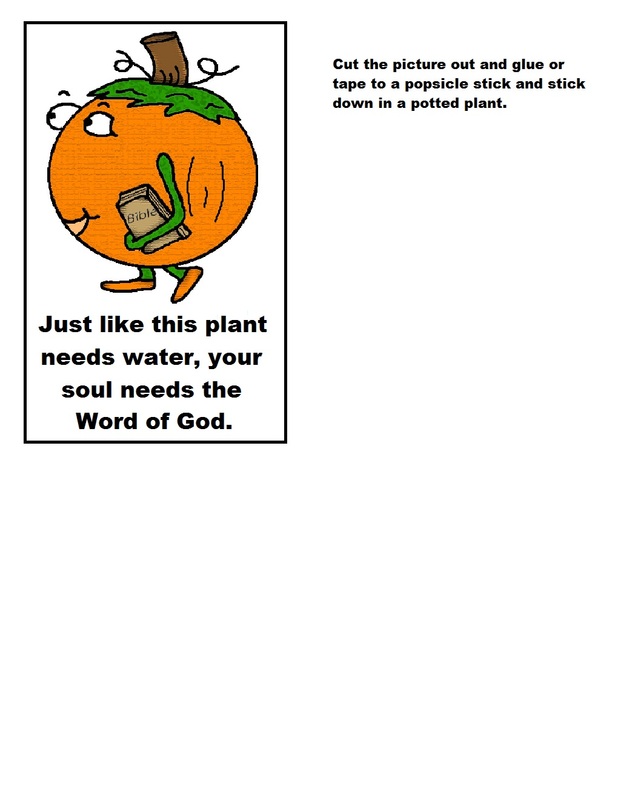 The words say, "Just like this plant needs water, your soul needs the Word of God. We need to teach our children that the Bible is very important and not something that should just lay somewhere gathering dust on a shelf. Some people are so protective of their Bibles that they lay it somewhere out of reach so it will never get picked up. The Bible is your sword. You need that word to protect you, encourage you, help you, and guide you. A plant needs water to live. If you do not feed it water, it will die. There is no way around it. Water is what gives it life. God made it that way. We are just like plants. We need the Bible in us everyday so we do not die. The devil can come against you and you are not able to stand against him if you do not know what that word says. You need the word at times to lift you up. God's written word will nourish your soul and fed you what you need just when you need it. It is a very powerful snack...lol..